We’re often asked, “What makes Proximity roasted products exceptional?” In short, they have invested in the latest technology to ensure the best possible outcome—because they know quality matters to you. The first of its kind in North America, the state-of-the-art roaster sets new standards for uniformity, precision, flavor development and grain integrity. The process starts with stainless steel tubes coiled around a central motor. Grain is fed into the bottom of the roaster. The motor shakes the roaster in order to move the grain upward through the coils and to maintain the grain contact with the hot metal, which is where the color and flavor development occur. Because of the rapid and precisely controlled temperatures, the metal in different zones allows for greater process accuracy than in traditional drum roasters. By controlling the grain’s contact with the hot metal, and varying batch time, temperature and moisture, we manipulate color and flavor development start to finish. The roasting process also maintains grain integrity more successfully than traditional roasters. When the husk of a grain is skinned, the endosperm is exposed. And since the endosperm tends to burn faster than the husk, a skinned kernel results in uneven coloration, as well as burnt and acrid off-flavors. The process minimizes husk breakage, creating more consistency within each kernel of grain, which means more consistency within the entire malt batch. The stainless steel tube interiors are smooth, as opposed to the slotted screen floors of the drum roasters. This ensures a gentler, less abrasive process, – and most importantly, less skinning of the husks. 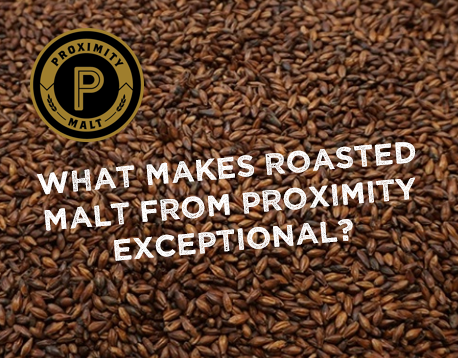 Proximity’s roaster, along with our seasoned team of maltsters, brings greater product development flexibility and quality control than ever before. With our continuous roasting process, they make as much of a specific product as necessary without the need to blend between batches. It allows us to offer an extensive range of products either in stock, or readily available. For example, they carry not just one, but three chocolate malts: pale chocolate (to average 300 L), medium chocolate (to average 350L), and dark chocolate (to average 400L). For brewers looking for a particular flavor or color, they can work with them to dial it in. The innovative roaster design allows for precise, customized roasting of any grain, flour, herb, or coffee bean, regardless of kernel sizing. They have great reasons why our roasted products are truly exceptional. But please, don’t take our word for it: Contact us for chew samples, to see, smell and taste the difference of Proximity Malts. Follow this link to request an array of chew samples sent you, free of charge. We’re confident you’ll find that Proximity Malt can help create a brew as exceptional as you!